Second, returning to developmental positions (such as quadruped, prone, supine or side sitting) will encourage the use of fundamental movement patterns that can be easily neglected in everyday life. This is because developmental positions constrain many movement options that are available in standing, in a way that biases the mover in favor of using fundamental movements, as opposed to highly specialized or idiosyncratic movements that are only good for one particular task. 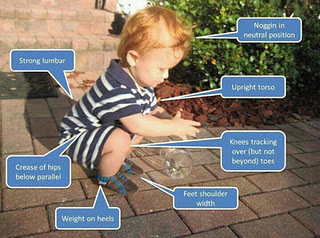 This is why so many rehab programs involve movements done in developmental positions on the floor as opposed to standing. In this post, I'll argue that adding resistance to a movement has similar effects to assuming a developmental position, in that it creates constraints on the possible movement patterns that can be used to perform the particular task. These constraints encourage the mover to find a very foundational movement pattern that is highly useful in a wide variety of contexts, as opposed to some very specific and idiosyncratic pattern that does not have broad utility. If I decide to pick something up off the floor that weighs a pound, there are literally hundreds of different movements that I can use to perform this task. I could be on my tiptoes, reach with an arm behind my back, or bend sideways to pick up the object. The options are endless. Most of them will involve combinations of joint movement that I might never use again. But if I start adding weight to the object, my range of options narrow, until I am eventually obligated to use a very foundational, powerful and developmental hip hinge/squat pattern. The pattern would not look much different from a toddler picking up a heavy toy. This is why many trainers who coach the squat have recognized that their clients will often improve their squat form when some weight is added. Dan John popularized the goblet squat as way to clean up squat form that looks sloppy when unloaded. The placement of the weight in front of the body is a constraint which prevents the use of undesirable movements that are easier without load. Thus, although the weight is a form of resistance to the muscles, it is a form of assistance to the nervous system in finding the best movement pattern. To use another example, I could walk with my arms and legs moving in a homolateral pattern instead of cross lateral, if I tried. That is, I could move the right arm forward and back in sync with the right leg instead of the left leg. But as I started to walk faster, the homolateral pattern would be almost impossible to maintain, and the cross lateral pattern would emerge spontaneously. (Try it.) The primal pattern becomes obligatory with speed. The take away message here is that if we continually place ourselves in a movement environment with very few constraints - where one movement works just as well as another to accomplish a task - there is very little to encourage use of the fundamental movement patterns that are the foundation for our function. But if we put ourselves in a situation where use of primal patterns is more obligatory – developmental positions, or movements that require force, speed or power - then we are obligated to maintain and refine these patterns. But if you are free of pain, working on movements that create the most speed, power and force - deadlifts, squats, lunges, pushes, pulls, sprints, jumps, throws and kicks - is one way to maintain and even improve good patterns of movement. And you get fit in the process.